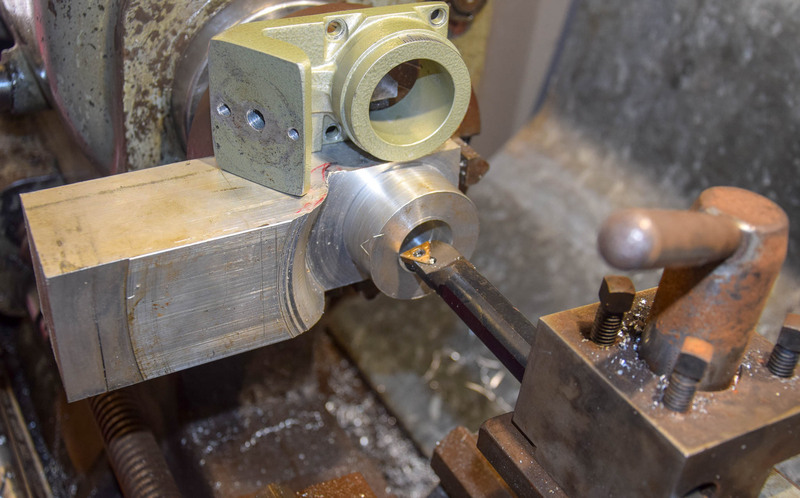 Thank you Øivind, I appreciate that, I will follow up the links later, in the meantime here are some pix of the chunk in the lathe and my rough sketches which will give you some idea of my design. It's evolving as I go so what you see may vary from the finished article. 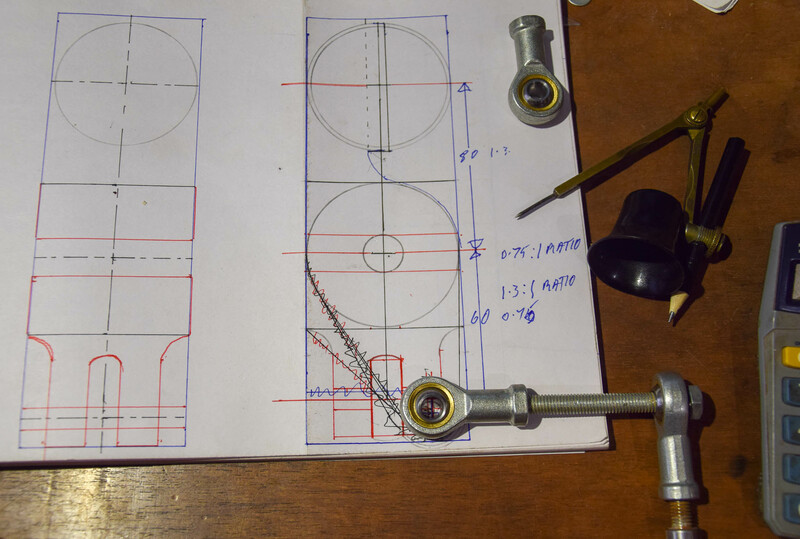 These are my sketches, simplistically I am re-creating the bracket which bolts to the gearbox and which surrounds the polar scope, my bracket will have a pivot shaft through it where the original bracket had an angled platform to bolt to a tripod or table top. Below the central pivot will be a clevis into which a rose joint will seat providing the required adjustment from 0º, horizontal, or just below (allowing for terrestrial setup and checking), to +60º giving some margin for the tripod to be out of kilter. I am still working on the base design, once the arm is finished I will turn my attention to the base, although of course I am hoping the arm will have avoided as many pitfalls as I can envisage. The adjustment screws for the azimuth will turn the mount 1.4º per revolution and the altitude adjustment will raise or lower the aim by 1.25º per revolution of the adjustment screw, pretty well in line with the current Vixen base adjustments. Here is the chunk of aluminium, 2.5" square bar, about 9" long. I am boring out the hole for the polar scope. 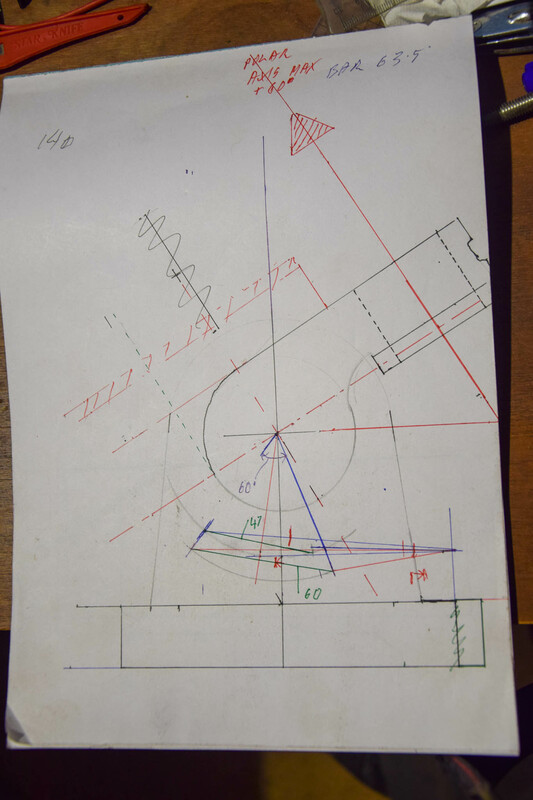 The pivot hole and the adjustment pivot will of course be at 90º to the polar scope hole, vertical bored in the below illustration orientation. The original painted bracket is included for comparison. One aspect of the design which is troubling me is how to lock the rotation of the altitude adjustment axis very positively without causing marks on shafts or machined faces. 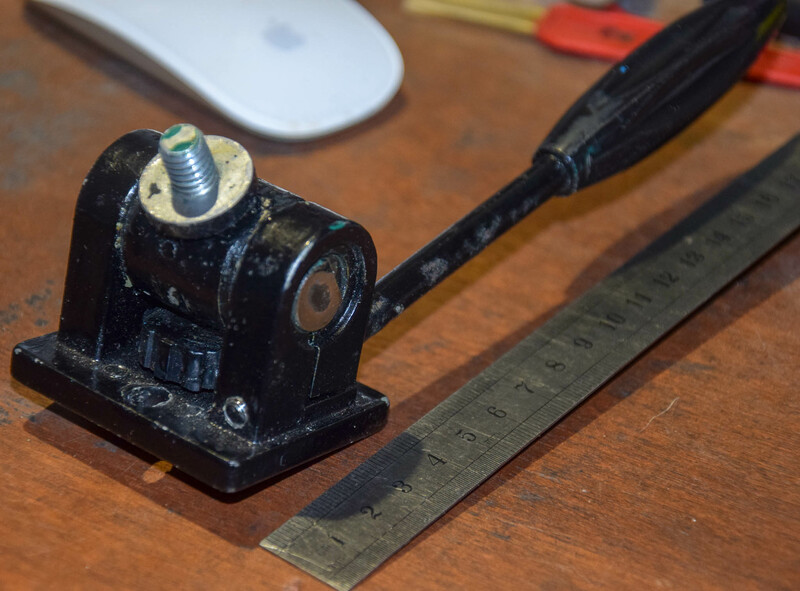 I am considering having the main pivot slightly loose axially and embedding a bicycle brake disk pad in either side of the trunnion side brackets, which can be clamped with a lever, a bit like a bicycle brake disk. I want the brake to have zero effect on the altitude or azimuth settings, delicate as they are. 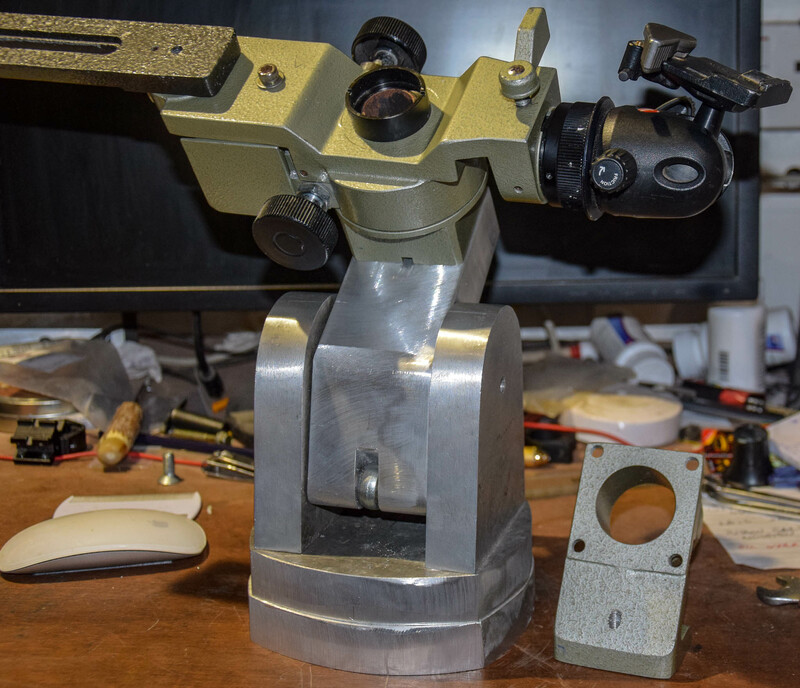 The azimuth adjustment will be in the base with two opposing adjustment screws operating on a dovetail stop, which will have dual duty of adjusting the azimuth and tending to clamp the rotating section to the stationary platform on top of the tripod. All of which I am trying to keep as compact and low profile as possible, while allowing for essential freedom and 'elbow room' for the movements of the mount. 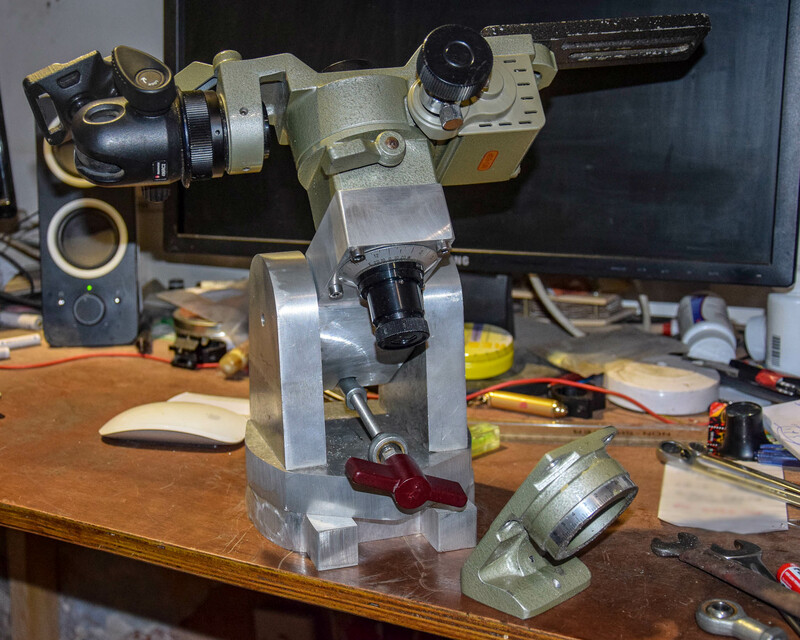 I may also embed two small brake disk pads in the interface between the azimuth rotating part of the base and the bottom (tripod head) plate to prevent movement and stabilise the assembly. I am making progress, the main components are cut out and almost finished, with the exception of the lower base plate, which I cut out today. I have to make the azimuth adjustment mechanism to make fine sideways adjustment of the polar mount. It's getting pretty heavy... The Vixen Polar mount and my Polar wedge bracket together weigh about 7.5Kg. According to Vixen their part is capable of supporting a 7Kg payload, my D800 together with the 300mm f/2.8 are well less than that. That said I don't fancy carrying it too far up mountains. Some pix... The small green casting is the original Vixen wedge mount. This is the altitude adjustment, 8mm stainless M8 threaded rod, I tried to obtain fine pitch rod which would have been more rigid and finer adjustment but it proved hard to get, so I decided to try standard 1.25mm pitch. According to my calculations the ratio is 1.25º adjustment per turn, which is in line with the current Vixen mounts, the azimuth adjustment is currently calculated at 1.4º per revolution of the adjuster but that might change to less than 1º per turn, when the design is finalised. This is the front of the assembly, it looks sturdy, I guess I could have made it with metal half the thickness but it's what I have. The range of elevation adjustment is from 44º to 60º, the azimuth adjustment will be between 5º and 10º either side of 0º, in other words 10º to 20º total. This depends on the pivot point location, which is undecided at the moment. I had been hoping to have caught some clear skies but they are turning cloudy despite the prevailing high pressure. Keenly looking forward to being able to try the Vixen EQ mount on a solid wedge bracket. 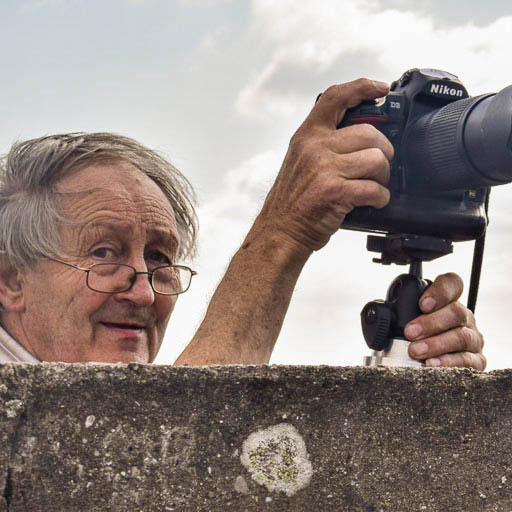 One final thing, I have had an idea for the setting up, instead of hands and knees on the floor, kneeling in muddy field or rocky mountain... I am planning to try to use my Go-Pro Session, a little cube camera to view the alignment through the Polar scope either on my laptop, iPad or my iPhone. I have tried it on my desk and it works so I have to make up a proper Go-Pro camera mount which will hold the camera on the eyepiece of the Polar scope. I think it will be much easier to see what I am doing. Fascinating adventure in fabrication, Seapy! As before, amazing job, Robert! Great work Robert, thanks for updating us. Best wishes for clear sky to test it.